Does your business provide a service to people living in or visiting Northumberland? If you'd like to reach thousands of new potential customers then you need to advertise with Your Northumberland Guide! This page tells you about the type of adverts that are on offer on the website and how much each one costs. You're not just buying an advert, you're buying into a whole network with the use of my Twitter account (@ynorthumberland) and Facebook Page* to announce new adverts. If you need more information about anything please email me. You can now buy an advert for your business in one of our monthly newsletters for just £25. This one off piece of advertising goes out to everyone on our mailing lists and is disseminated through our ever growing social networks. Each advert comes with a small photo of your choice, a short paragraph of text and a link to your website. This advertising has proven to be incredibly successful as it goes right to the inbox of thousands of people each month. Click the buy now button on the right to purchase an advert and we will contact you shortly afterwards for your photo and text that you would like to use. If you'd like a little extra publicity for an event or business we can help! Promotion through our social networks can raise awareness to thousands of people. For just £25 we'll tweet, Facebook, blog and shout from the rooftops to create some buzz and get the word out there. On average our Social Network campaigns reach well in excess of 20,000 people and if you're running an event can start up to four weeks in advance. Click the buy now button on the right to purchase an advert and we will contact you shortly afterwards by email for the information and any images you would like to use in the campaign. A basic listing of your accommodation on Your Northumberland Guide is free, and always will be. However, if you'd like to be noticed above the rest of the places to stay in your area you can purchase a 'Featured Accommodation' advert. This appears at the top of the accommodation page for your area and gives you the opportunity to showcase two photographs of your property and add up to seven lines of text. Each new property advertised will also be announced through the ever growing Your Northumberland Guide network on Facebook and Twitter, for a little extra exposure. Advertisers are also free to use my Twitter (@ynorthumberland) and Facebook Page* to advertise breaks and special offers to thousands more people! (*subject to a maximum usage policy). A 'Featured Accommodation' advert represents excellent value for money at just £25 for twelve months. Click the buy now button on the right to purchase an advert and we will contact you shortly afterwards for images and text that you would like to use. 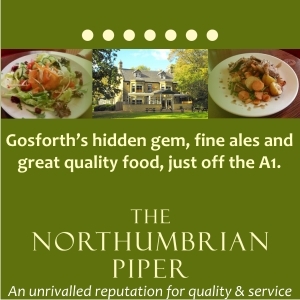 Contact me at enquiries@yournorthumberland.co.uk if you would like to place an advert. Does your business target a specific area? If so, you're probably better using the Area Guide Advertising option. This allows you to target specific areas and places a banner advert 728 x 96 pixels as shown below (but placed vertically) on an Area Guide page of your choice. So if your business is located in Alnwick, you might like to choose the main Alnwick Area Guide page etc. A large percentage of our website visitors live in Northumberland, so this is an excellent opportunity to reach a captive audience. There is no minimum order value, so if you'd like to 'test the water' for a month you are more than welcome to. All this and I'll even design the advert for you free if you need me to! This space is 300 x 250 pixels and appears right at the top of the page, fully viewable when the page is opened by a visitor. The example on the right is the actual size of the advert. For complete coverage and to save up to £15 you can buy a package advertising deal for £60. This includes a newsletter advert (worth £25), Event/Social Media Advertising (worth £25) and a 1 month advert on our Events and What's On Page (Worth up to £25). This advertising blitz can reach well over 30,000 people! Click the buy now button on the right to purchase an advert and we will contact you shortly afterwards by email for the information and any images you would like to use in the campaign.